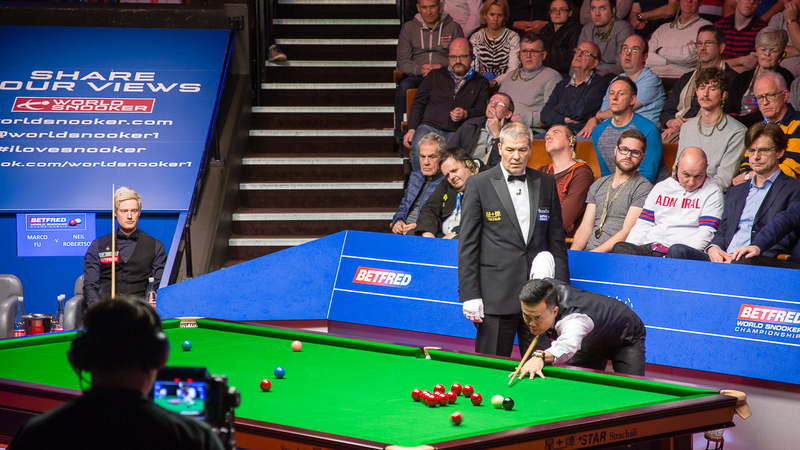 Marco Fu won a gripping match 13-11 against Neil Robertson in the last 16 of the Betfred World Championship, to earn a shot at title-holder Mark Selby. Hong Kong’s Fu came from 10-8 and 11-10 down to win five of the last six frames, sealing victory on the final black of a dramatic 24th frame. He now meets Selby over 25 frames in the quarter-finals on Tuesday and Wednesday, in a repeat of last year’s semi-final which world number one Selby won 17-15. 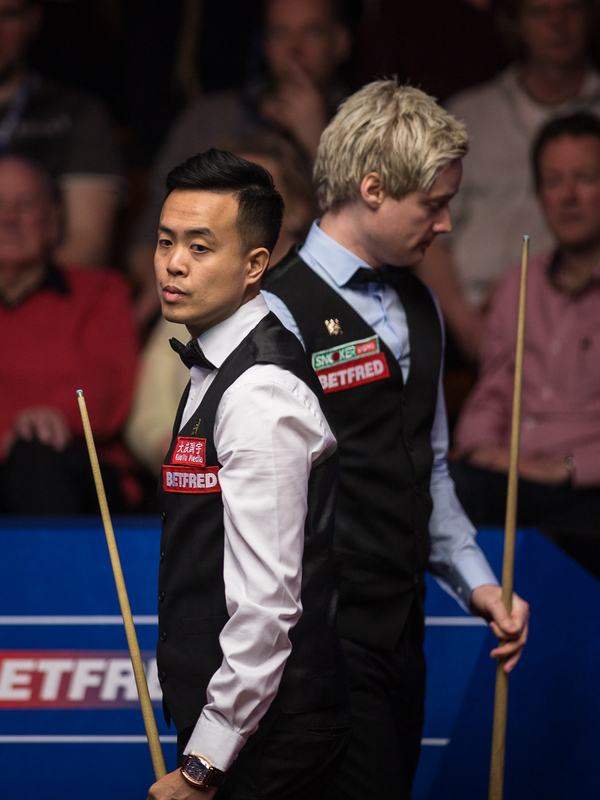 Fu has had one of the best seasons of his career, winning the Scottish Open in December as well as reaching the final of the Players Championship and three other semi-finals. He has battled through the first two rounds at the Crucible – beating Luca Brecel 10-9 before another fierce clash with Robertson – and must now summon the strength to take on snooker’s toughest competitor. Australia’s Robertson won the first two frames tonight to go 10-8 ahead before eighth seed Fu hit back with breaks of 78 and 115 for 10-10. A scrappy 21st frame came down to the final black and Fu missed a thin cut to a baulk corner, allowing his opponent to pot it and regain the lead. Robertson let out a howl of delight and a fist pump at what he felt to be a crucial moment. But 39-year-old Fu dominated the next frame then made a 69 to go 12-11 ahead. He looked to be sailing to victory in the 24th until he got a kick on a red at 57-0. Robertson, the 2010 champion, replied with 35 and later laid a snooker on the green which earned him a chance to clear. But he missed a tough final black to a baulk corner, and Fu – using the long rest – held his nerve to roll the black home. Fu, a semi-finalist in Sheffield in 2006 and last year, said: “The standard was very low. We can both play much better than that, especially Neil. He’ll be very disappointed with the way he played tonight. In the end I’m very happy with the win. I didn’t play well but I’m very happy with the way I was fighting. “I think I just need a quicker start, I was 7-1 down in the first match, and 4-1 down in the second match, you can’t really do that against the best player in the world. I’m still playing my way into the tournament. This quarter final match will be a different story, I think a quick start is essential against Mark. World number nine Robertson, who has not won a title since the Riga Masters at the start of the season, said: “It was absolute garbage, the match was awful all the way through. The only time that I felt like myself was when I gave it the fist pump to go 11-10 up. It’s the way I’ve got to play, I’m sorry to future players that are going to get the fist when I win a big frame on the black. “I’ve tried to play within myself but I need adrenaline, I need to be pumped up, I need that to play well. I have to play with passion next year. I’m not saying that I’m going to start running around the table but I’m going to be a lot more aggressive. In the first round I was trying to be polite, too polite, I’m going to be showing my emotion when I feel like it.